A new flooring underlay developed by a company specialising in the manufacture of insulation materials has been launched on the UK market this month (October). Decibex flooring products have been on sale on the continent since the beginning of the year, but are now being sold in Britain for the first time. The brand includes a range of premium underlay products for laminated, parquet, vinyl and hard wood flooring. Decibex is being distributed in the UK by The Autins Group, who are well known in the automotive industry for developing and manufacturing acoustic and thermal insulation materials for a range ofapplications. Decibex is supplied from The Autins Group’s German and Swedish sites. Many products in the range have been awarded the GermanU Mark standard and theFrench A+ standard which qualifies them for sale across Europe. The first UK customer to come on board is a global flooring manufacturer,selling a projected minimum volume of 45,000m² per year. Autins are alsotargeting the UK DIY market and the company is in talks with a nationwide DIY chain. Whilst Decibex products have been part of the Autins UK portfolio for some time, the company has created a new brand image for the UK launch. All product information, including data sheets, test reports, labelled samples and band rolls with specific barcodes are now available in English, German and Swedish. 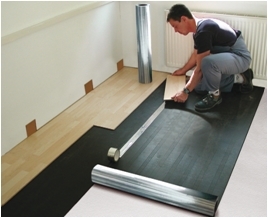 The products have also been fully tested and certified through an accredited underlay testing company (TFi GmbH). The Autins Group is comprised of UK operation Automotive Insulations and sister companies Scandins in Sweden and Rheinland Insulations (RI) in Germany.Although best known for their work developing insulation materials, when the company set up Scandins and RI in 2012 and 2013 respectively, this enabled the group to extend its product range and diversify into different sectors.